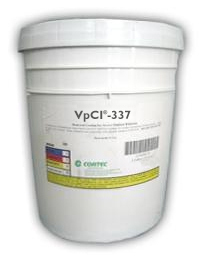 Cortec VpCI-337 is a ready-to-use waterborne corrosion inhibitor for indoor use. Vapor phase corrosion inhibitors in VpCI-337 migrate and protect metals surfaces, resulting in time and cost savings. VpCI-337 is used to protect edges of coils and stacks or to fog void spaces, tanks, containers, packages and enclosures. These labor-saving techniques use a minimum of product to protect large areas or volumes. VpCI-337 is effective on ferrous metals as well as aluminum and plated steels. VpCI-337 is consistently successful in providing protection to the basic metals, metalworking and packaging industries. Products protected by VpCI-337 are always ready-to-use. No degreasing or stripping is necessary by the end user. The metal will retain a clean, rust-free surface. The thin protective film has been proven not to affect paintability, conductivity, appearance or any other important property of metals or alloys. Available in 5 gallon pails (Cortec Product Code 12000033) or 55 gallon drums (Cortec Product Code 12000034). 5 gallon drum weighs 50 pounds and ships under our standard shipping rates. The 55 gallon drum must be shipped by truck. We will provide you with a freight quote before we ship this product. Do not let product freeze. Leaves a thin, self healing film that is environmentally approved for use. Protection is immediate, convenient to apply and easy to remove if required. Gives up to 12 months of indoor protection. Note: Product may become hazy after a few days. Fog or mist VpCi-337 Concentrate into containers, boxes, crates and shrouded packages at a rate of 1 pint (0.4 liter) for every 50 cubic feet (1.4 cubic meters) of enclosed space. Spray on cardboard, wood pallets, closed and open cell foams and other packaging materials. Always spray VpCI-337 uniformly within enclosure and allow direct access of vapors to metal surfaces to be protected. Mix thoroughly if separation or settling has occurred. Use soap and water to clean equipment.